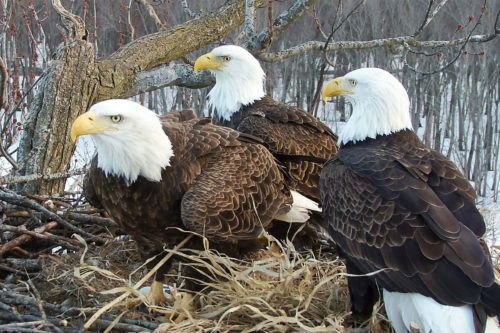 A rare trio of bald eagles in Illinois are raising eyebrows as the birds model a thrupple relationship. Even more striking, the male birds have been together for years before the female joined the couple. Valor I and Valor II, the dads, and mom Starr are raising three eaglets together in a nest near the Mississippi River. While bald eagle trios have been documented before, this thrupple is a little unusual. Both male birds copulate with the female. In the other cases, the second male bird has normally served as a “nanny” for the eaglets. But even more unusual, it’s not the first time the male birds have been in a thrupple relationship. The Washington Post reports that adding Valor II to the mix may have saved their first relationship – and the babies. But after Valor II unpacked his suitcase in the nest, things started to change quickly. Valor I pulled his stuff together and started being more parental. In 2017, tragedy struck as other eagles attacked the thrupple’s nest repeatedly, and Hope was lost. The male birds successfully fought off the attackers each time and continued to raise the eaglets together until it was time for them to fly the nest. Starr joined the couple last fall, laying three eggs. The eaglets will fledge in the next few weeks and you can watch the action live via a webam set up in the park.